This week I walked around the city instead of hiking. I decided to walk to a couple pieces of public art - one that I've seen from afar for a few weeks now and one that was unveiled this week. My path to the first piece of art took me past garbage with interesting stencils and an interesting Serbian Orthodox Church. I walked past a suburban horse/donkey/goat ranch right in the middle of a residential neighborhood. I passed a beef packing plant where I saw large bins heaped full of cow hides, still rather ... raw on one side. What almost got me to pull my camera out was a dump truck with a big sign that said "Inedible. Not for Human consumption." It was parked under the end of a conveyor belt sticking out the side of the building spewing all sorts of disgusting guts into the back of the truck. There were people standing around and I was afraid if I took pictures I would look like some tree-hugger vegan taking incriminating pictures for some PETA publication and they might chase me down and beat the crap out of me. Or I may just have a hyperactive paranoid imagination. 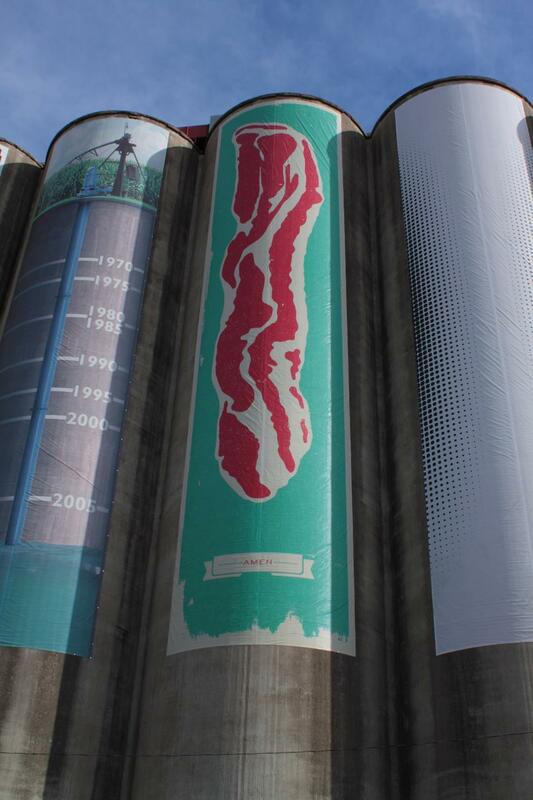 The first piece of public art on my itinerary were displayed on the side of a large abandoned grain elevator just off the interstate. 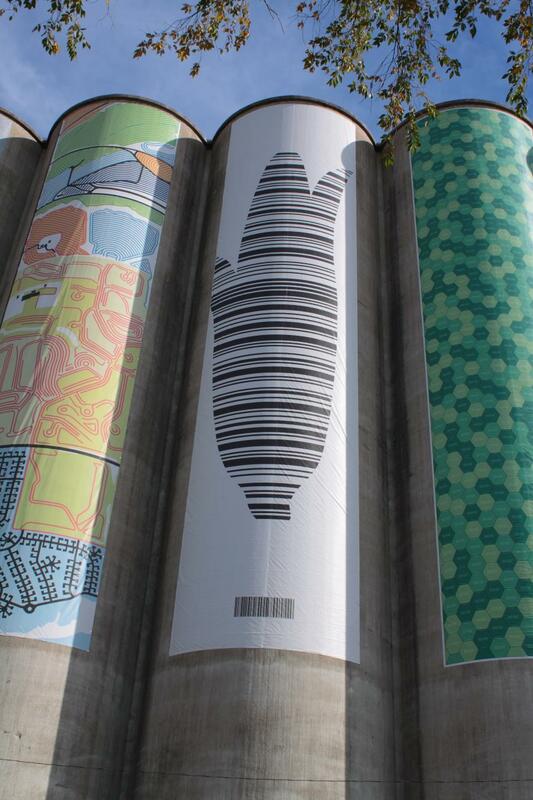 Huge canvases have been draped on thirteen of the silos. The canvases are part a project/contest called Stored Potential. While most of my pictures came out, it is easier to see the pieces at the website's gallery found here. They were all pretty cool but I particularly like the ones called "Bacon" (The small sign under the strip of bacon reads "Amen") and "Corn As Commodity". One end of the Field Club Trail starts at the elevator. The trail used to be a train right away which serviced the elevator among other places along the line. The trail is tree lined cuts through the land - It feels like you're walking through a canyon. Most of the trees had lost there leaves but there was still some color. Leaves, dislodged by the wind, rained down on the trail. The grass on either side of the trail was carpeted in leaves. 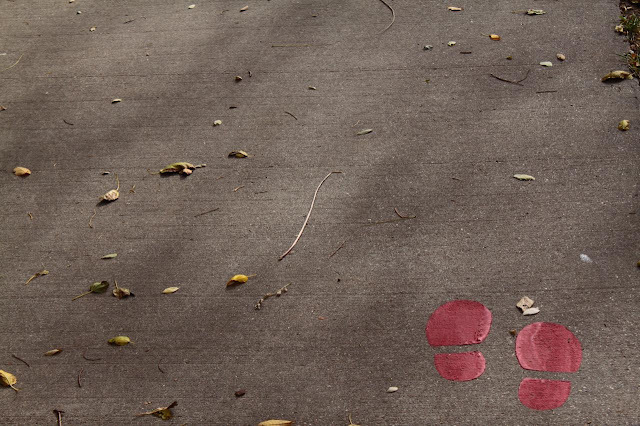 I resisted walking on the grass, shuffling my feet through the crunchy leaves, making the noises I associate with fall. I should have just given myself up to the urge. I suppress my inner fiver year old boy too much at times. Me In 20 to 30 Years ? After reaching the end of the Field House Trail, I turned west and made my way, via a stop at a fast food joint for some unhealthy 'food', to the next piece of public art. I'd seen a segment on the local news the night before the walk talking about the statues and sculpture at the Children's Hospital and had added it to my walking itinerary. 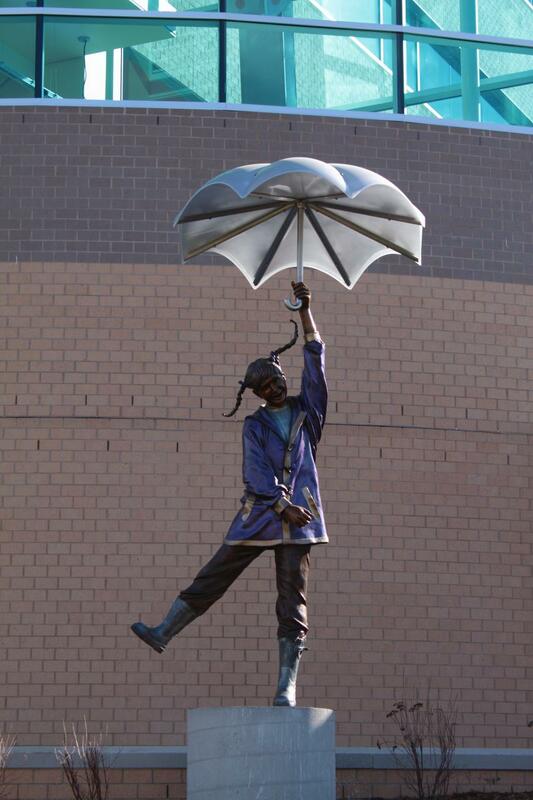 On the corner of the building statues of children with umbrellas smile at all the cars passing by on Dodge. The statues are very similar to the ones near the Quest Center which makes since since all these bronze statues were made by local Omaha artist, Matthew Placzek. The statues stand in front of a glass stairwell with suspended umbrellas that light up at night. 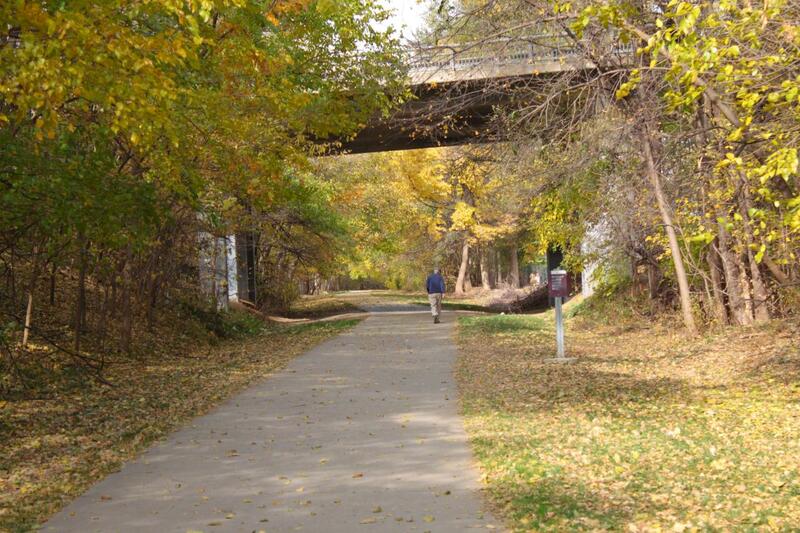 The rest of the walk took me through residential areas and eventually took me to the Big Papio Trail. I followed this trail, fighting the wind blowing in my face, to 72nd street before turning south and heading back home. I was pretty exhausted by the time I got home. This walk wasn't as long as my last and didn't have as much elevation but, at 19.42 miles with 3,127 feet of total ascent, it was up there in length. It was also a really warm day and I was a stinking ball of sweat by the time I got home. I enjoyed this walk. The Field Club Trail still had that fall feel and there is something about the fall that makes me feel content. I guess it's my body telling me that it's time to start hunkering down in preparation for winter. Strangely, the weather has not really been very fall like lately. On the day of this walk the high temperature was 72°F, just one degree below the record, with a warm southerly breeze. Three days later, the temperature is in the 40s and it's rainy. Crazy weather this year. I really liked the cascade of umbrellas and the elevator art. The kid sculptures were good, but kinda made me feel like some evil sorcerer put a spell on some happy kids so they would be bronze statues forever. FOREVER. Still, this is pretty frikkin awesome! :D I would love to see the umbrellas at night! Miss McC: I have to go back when the lights are lit and the umbrellas glow. I wouldn't worry about the children - those types of curses can always be broken somehow ... often with kisses. Where's The Fire ... Santa?!? Book: Paolo Bacigalupi's "The Windup Girl"